I was surprised to notice that Media with Conscience, which I read on a regular basis, has been, for a while, featuring cartoons by Ben Heine. I am writing to you to ask you to reconsider your association with him. Let me explain who Ben Heine is. 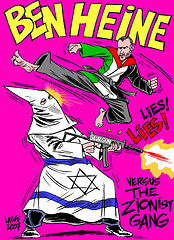 Ben Heine is a Belgian cartoonist in his early 20s whose main claim to fame is to have been the only Belgian artist (by the way, one among only a handful of European and US artists) who took part in the infamous 2006 Teheran holocaust cartoon contest. The Economist described the contest, on 14 September 2006, in terms that perfectly reflect Mr. Heine's 'art': “are wantonly anti-Semitic. The imagery is grotesque and predictable: Stars of David morphing into swastikas; the Statue of Liberty giving a Nazi salute. Subtle, the cartoons are not”. The full spectrum of European media from right to left critised the contest. Heine's idea of art is to portray politicians with bananas, bombs and phaluses coming out of their heads, or with Hitler's moutaches – indeed, subtle they are not, coarse they are! It is very difficult for someone like me, an activist/advocacy writer whose writings are considered unpalatable – and non-publishable – in the mainstream corporate media, to identify with the idea that someone’s work (literary or artistic) is simply objectionable because it won’t be touched with a ten-foot pole by The Economist or any “reputable” European newspapers. To me, MWC is a medium by which a few of us, hopefully many in the future, express our concerns about legal and civil rights issues; human rights, war and genocide; and economic and socio-political affairs. Each of us hopefully imparts a high level of experience and knowledge on the subject, always ready to defend our views and withstand the scrutiny of truth when challenged. At times we may be more passionate than that which is permitted in good journalism, but that is our own personal equalizer to “idealistic” contributory journalism...for in most cases, not only do we not get compensated for our work, but must subsidize it. Hah, touché! We in the alternative media cannot let ourself fall into the dispassionate mainstream media trap of denouncing Holocaust denial and anti-semitism. Take THAT, Economist! Meanwhile, Heine has been staunchly defended by his "true friend, spiritual brother," Brazilian political cartoonist Carlos Latuff. 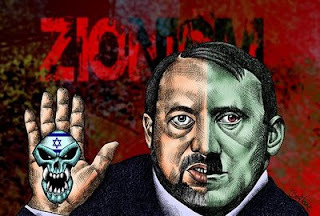 As previously noted here, Latuff won Second Prize and $4,000 in the Iranian Holocaust Cartoon Contest, and once published a cartoon accusing Jews of murdering homeless people in the streets of São Paul.